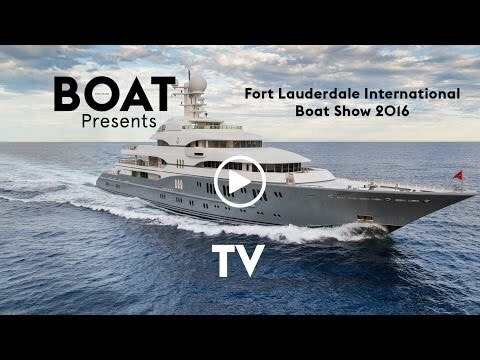 As one of the largest yachts at the 2016 Fort Lauderdale International Boat Show, TV certainly turned heads. This 78.4 metre Lürssen superyacht was exhibited by sales broker Moran Yacht & Ship and the Boat International team was privileged to step on board and take a proper look around. In this video, Ross Tannock, yacht broker at Moran Yacht & Ship, talks us through his favourite features of TV. Launched by the German yard in 2008, TV features a distinctive exterior with a grey hull and white superstructure, as designed by Espen Øino. TV’s lavish interiors were created by the late Alberto Pinto, accommodating 18 guests in 10 finely appointed staterooms, including a master suite, five VIP cabins, a double, a twin and two singles. A 27-strong crew ensures that guests on board TV can have their every whim catered to. There is no shortage of options for exterior relaxation and entertaining on board this four-deck superyacht, with a sky deck featuring a full bar and Jacuzzi, as well as an expansive superyacht helideck, which can seat up to 16 people for an al fresco meal. Back aft, the dedicated superyacht beach club features a gymnasium, spa, hammam and fold-down terrace for excellent views out to sea. Built for worldwide cruising, TV features a particularly impressive maximum cruising range of 6,000 nautical miles at 12 knots, while her twin Caterpillar 3516 DITA engines mean that a top speed of 18 knots is possible. TV is currently listed for sale with Moran Yacht & Ship, asking €92,000,000.